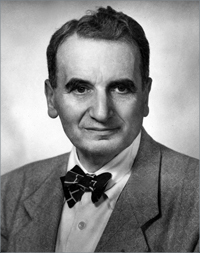 Theodore von Kármán was Director of the Guggenheim Aeronautical Laboratories at California Institute of Technology (1930-1949). Other institutional affiliations include Aachen Aeronautical Institute. His research interests included aeronautical engineering and fluid dynamics. May 11, 1881Birth, Budapest (Hungary). 1902Obtained ME, Royal Technical University, Budapest (Hungary). 1903 – 1906Research Engineer, Ganz and Company. 1903 – 1906Assistant Professor, Royal Technical University, Budapest. 1908Obtained PhD, University of Göttingen, Göttingen (Germany). 1909 – 1912Privatdozent, University of Göttingen. 1912 – 1928Consultant, Junkers Airplane Works. 1912 – 1929Director, Aachen Aeronautical Institute, Aachen (Germany). 1914 – 1918Officer, Austro-Hungarian Air Corps. 1924 – 1928Consultant, Luftschiffbau Zeppelin. 1926 – 1927Advisor and Consultant on Design, Guggenheim Aeronautical Laboratories, California Institute of Technology. 1926 – 1930Consultant, Handley-Page, Ltd..
1927 – 1929Consultant, Kawanishi Airplane Company. 1928 – 1963Research Associate (1928-1930); Director, Guggenheim Aeronautical Laboratories (1930-1949); Director, Jet Propulsion Laboratory (1938-1945); and Professor Emeritus (1949-1963), California Institute of Technology, Pasadena (Calif.). 1930 – 1935Director, Guggenheim Airship Institute, Akron (Ohio). 1933 – 1937Consultant, Special Committee to Investigate the Akron and Macon Dirrigible Disasters, United States Navy. 1934 – 1938Consultant, Metropolitan Water District of Southern California. 1938 – 1952Consultant, Ballistics Research Laboratory, Aberdeen Proving Ground, United States Army. 1939 – 1941Consultant, Wright Field, Army Air Corps, United States Army. 1939 – 1941Consultant, Smith-Putnam Wind Turbine for Development of Electricity. 1939 – 1942Consultant, Grand Coulee Dam Project. 1939 – 1947Consultant, Army Air Corps, United States Army. 1940 – 1960Consultant, General Electric Company. 1941 – 1943Consultant, High Speed Wind Tunnel, Boeing Aircraft Company. 1941 – 1949Consultant, Northrop Aircraft Company. 1942Consultant, Board to Investigate the Collapse of the Tacoma Narrows Bridge, State of Washington. 1944 – 1963Chair (1944-1954) and Chair Emeritus (1954-1963), Scientific Advisory Board, United States Air Force. 1947 – 1963Consultant, United States Air Force. 1952 – 1963Chair, Advisory Group for Aeronautical Research and Development (AGARD), North Atlantic Treaty Organization (NATO). 1955 – 1963Consultant, Convair Division, General Dynamics Corporation. 1955 – 1963Scientific Director, General Applied Science Laboratories, Inc.
1956Member, National Academy of Sciences. 1957 – 1958Director, NAS-Air Research and Development Command Summer Study Groups, National Academy of Sciences and United States Air Force. 1958 – 1963Consultant and Chair, Technical Advisory Committee, Allison Division, General Motors Company. 1959Victor Emanuel Visiting Professor for Engineering, Cornell University. 1960 – 1963Consultant and Member, Board of Directors, Tool Research and Engineering Corporation. 1961Member, Board of Trustees, Washington Planetarium and Space Center. 1962Awarded National Medal of Science. May 7, 1963Death, Aachen (Germany). Advised by Von Kármán at California Institute of Technology, "The effect of curvature on the transition from laminar to the turbulent boundary layer." Advised by Von Kármán at California Institute of Technology, "On the development of turbulence," and both employed at California Institute of Technology. Advised by Von Kármán at California Institute of Technology. Advised by Von Kármán at California Institute of Technology "The effect of shear instability on the transverse circulation in the atmosphere." Obtained ME (1902). Assistant Professor. Research Associate and Professor Emeritus. Victor Emanuel Visiting Professor for Engineering. Director, Advisor, and Consultant on Design, Guggenheim Aeronautical Laboratories and Director. Consultant, High Speed Wind Tunnel. Consultant and Chair, Technical Advisory Committee, Allison Division. Member and Director, NAS-Air Research and Development Command Summer Study Groups. Chair, Advisory Group for Aeronautical Research and Development (AGARD). Consultant; Chair and Chair Emeritus, Scientific Advisory Board; and Director, NAS-Air Research and Development Command Summer Study Groups. Consultant, Grand Coulee Dam Project. Consultant, Special Committee to Investigate the Akron and Macon Dirigible Disasters. Oral history interview with Theodore Von Karman, 1960. Theodor Von Karman papers, circa 1899-1968. Theodore von Karman collection [microfiche], 1881-1963. Henry H. Arnold papers, 1903-1963 (bulk 1940-1946). Johannes M. Burgers autobiographical notes, 1954. Johannes M. Burgers papers, circa 1912-1980. Lauris Norstad papers, 1930-1987 (bulk 1942-1962). Oral history interview with Adolf Busemann, 1979 Summer. Oral history interview with Lee A. DuBridge, Parts I and II, 1981. Oral history interview with Walter M. Elsasser, 1985 November 21. Oral History interview with William H. Pickering, 1978. Robert Millikan papers [microform], 1821-1953 (bulk 1921-1953). Stanford S. Penner papers, 1938-1998. The first twenty years [sound recording], 1962 : narrated by William E. Zisch, produced by Richard L. Spears. Bringing aerodynamics to America / Paul A. Hanle. Collected works of Theodore Von Kármán, 1952-1963. Die Quantentheorie der spezifischen Wärme / [von] Einstein, Debye, Born [und] Kármán. Mathematical methods in engineering; an introduction to the mathematical treatment of engineering problems, by Theodore v. Kármán and Maurice A. Biot. The wind and beyond : Theodore von Karman, pioneer in aviation and pathfinder in space / by Theodore von Karman with Lee Edson. "Von Kármán between Aachen and Pasadena," Progress in Aerospace Sciences 59 (2013): 2-12. The universal man : Theodore von Kármán's life in aeronautics / Michael H. Gorn. Theodore von Kármán Physics Today obituary.